Fans who stream into the Navy Yard district before Nats games are now greeted with increasingly varied entertainment choices, from Yards Park for fresh air and views of the Anacostia River to the Fairgrounds for frat-rock music and adult refreshments to a variety of neighborhood restaurants and taverns, with more to come. “Nats,” for the uninitiated, refers to the Washington Nationals, the DC-based team currently leading the National League East division by the largest margin in baseball. St. Vincent de Paul is located literally as close as anything to the ballpark, just a block away. That location (and the city’s growing enthusiasm as a “baseball town”) has produced dividends for Reverend Andrew Royals. 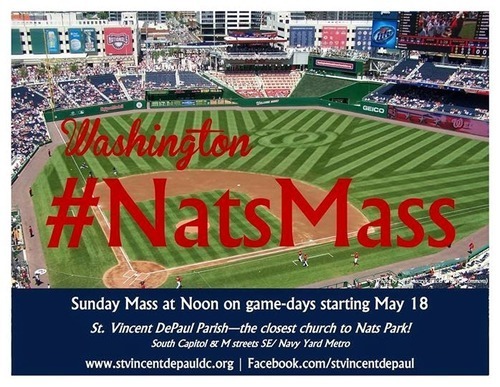 Starting at noon, the service runs 40-45 minutes (short for a Catholic mass) so that patrons have plenty of time to wrangle the family or enjoy a couple of beverages before the typical 1:35 pm first pitch on Sundays. Through a combination of signage, word of mouth and the twitter hashtag #NatsMass, Royals says attendance has reached 75-100 people for the Sunday service. By next year, he expects to max out capacity at 150. Even if you aren’t fortunate enough to be located next to a top-tier baseball team, this is a good lesson in how a church, by being part of its community, can reach new worshipers. The gospel wasn’t spread in a vacuum; Jesus was big on the idea of getting out into the world to spread his message. If baseball existed in his time, drawing stadiums full of 40k+ people, you’d better believe he’d have been there. Want more ideas for growth? Visit FaithStreet.com for ways to grow your church through our online network and online giving platforms.